Home » A Circassian of distinction in his ordinary Dress. The Circassians are, upon the whole, a handsome race of people. The men, especially among the higher classes, arc mostly of a tall stature, and Herculean structure; they are very slender about the loins, have a small foot, and are uncommonly strong in the arms. 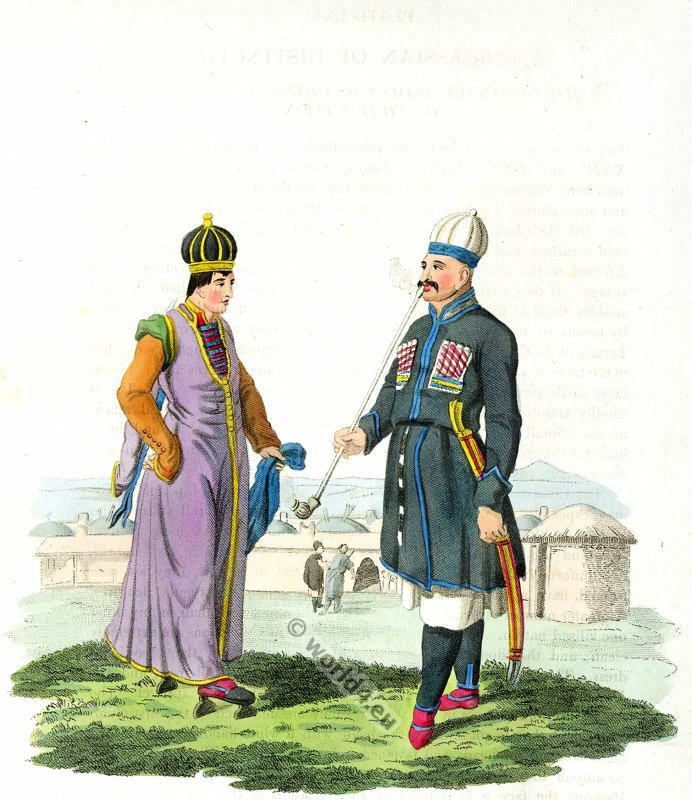 The women are, indeed, not uniformly Circassian beauties, but, for the most part, they are well formed, have a white skin, dark-brown or black hair, and regular features. A greater number of beauties are, however, to be met with than in any other uncivilized nation. In their villages and houses the Circassians are extremely clean; and this domestic virtue they likewise display in their food and dress. 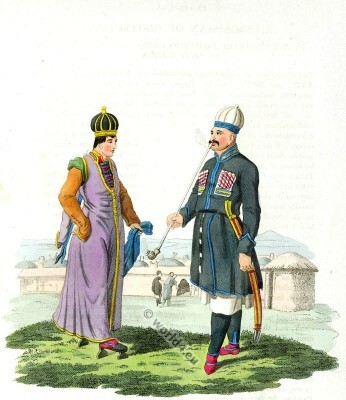 The opposite engraving represents a Circassian Nobleman, and the Daughter of a Circassian Prince, in their ordinary domestic apparel. The females uniformly dress in this style, till they arc delivered of the first child, after which they begin to cover the head with a white handkerchief, drawn close over the forehead, and fastened below the chin. When the females go abroad they wear a species of wooden clogs, to preserve their feet clean. Painting the face is considered as an indication of the want of chastity; but girls are permitted to dye the nails of their fingers with the flowers of the balsamina, which in their language is called Kna.